An old path marked by numerous fossilized tracks in south central Oregon’s Lake County may reveal clues about the family dynamics of ancient Columbian mammoths. The trail, an Ice Age trackway, was discovered by the UO’s Greg Retallack, a paleontologist with the Museum of Natural and Cultural History, while on an exploratory field trip in 2014 with six UO students in a class about fossil plants. 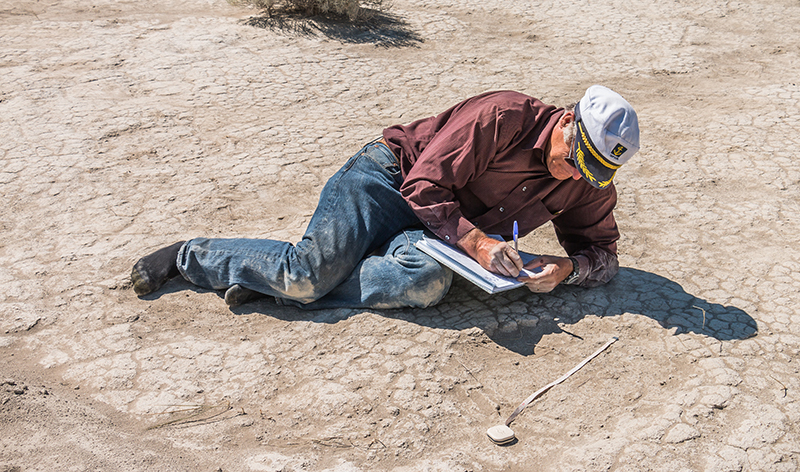 Unsure of exactly what the site might hold, Retallack, along with UO science librarian Dean Walton, returned to the location last year with researchers from the museum, the Bureau of Land Management and University of Louisiana to excavate the trackway. The team identified 117 impressions, dated to about 43,000 years ago, that are thought to represent footprints of adult, juvenile and infant mammoths in a layer of volcanic soil at Fossil Lake, an ancient basin first excavated by UO science professor Thomas Condon in 1876. The remote site, 65 miles southeast of Bend, is administered by the Bureau of Land Management. Elephants once roamed much of North America, with woolly mammoths across Alaska and Canada, and Columbian mammoths from Washington state to South Dakota and south into Mexico. Most went extinct about 11,500 years ago, but some isolated populations of woolly mammoth persisted until 4,000 years ago. The excavation was done under a Bureau of Land Management permit and funded by a Sandal Society grant from the Museum of Natural and Cultural History, made possible by tax-deductible gifts of at least $1,000 that are used to support field research and educational programming. Specimens found in Condon’s excavation — along with the rest of Condon’s large collection of fossils — were donated to UO in the early 1900s and form the core of the Museum of Natural and Cultural History’s Condon Fossil Collection. That collection, today, is under Retallack’s direction and boasts upwards of 50,000 fossil specimens. Last month a new state law went into effect, making the museum Oregon’s default repository for fossils found on state lands. The museum also is a designated repository for artifacts and paleontological specimens collected from public lands administered by the Bureau of Land Management in Oregon, ensuring they are available to future generations for education and research.